Rainbow Hill Language Lab had an excellent blog post up on learning Japanese through reading. He makes the point of Japanese being easier to read than listen to because of the way words run together. There being no way to pause or rewind an audible conversation, it is a leap to listen to a speaker just talking in his (or her) language with a limited vocabulary and even with that it can still be a challenge: just listen to the rapid fire Japanese of manga live reader Rikimaru Toho in the video. Learning Japanese through reading can help to overcome this because you are able to slow down and look something up and return to the text and pick up where you left off. 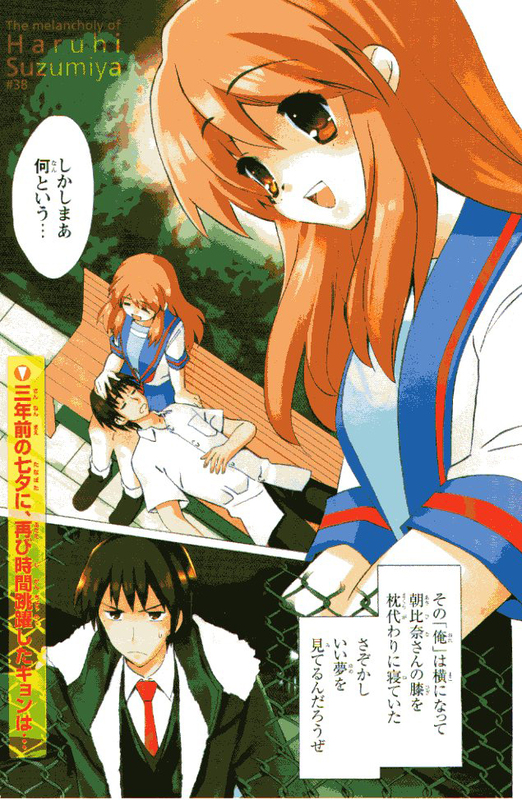 Coming soon to this blog – an series of scans from an old Melancholy of Haruhi Suzumiya manga starting with the above page. Practise with a purpose. AlphaRalpha, can’t wait to see the scans and your translations. I’m really enjoying getting back into my manga after spending too much idle time on the bus tweeting. Reading is really a form of escapism that is very hard to replicate with any other media. I’ve got you in my feed reader now!